This article duplicates the scope of other articles, specifically, Economic planning. Please discuss this issue on the talk page and edit it to conform with Wikipedia's Manual of Style. A planned economy is a type of economic system where investment and the allocation of capital goods take place according to economy-wide economic and production plans. A planned economy may use centralized, decentralized or participatory forms of economic planning. Planned economies contrast with unplanned economies, specifically market economies, where autonomous firms operating in markets make decisions about production, distribution, pricing and investment. Market economies that use indicative planning are sometimes referred to[by whom?] as planned market economies. A command economy or administrative command economy describes a country using Soviet-type economic planning which was characteristic of the former Soviet Union and Eastern Bloc before most of these countries converted to market economies. These terms highlight the central role of hierarchical administration and public ownership of production in guiding the allocation of resources in these economic systems. In command economies, important allocation decisions are made by government authorities and are imposed by law. Central planning has been used in the majority of countries adopting socialism including those based on the Soviet model, though a minority have adopted some degree of market socialism, such as the Socialist Federal Republic of Yugoslavia. Non-market socialism replaces factor markets with direct calculation as the means to coordinate the activities of the various socially-owned economic enterprises that make up the economy. More recent approaches to socialist planning and allocation have come from some economists and computer scientists proposing planning mechanisms based on advances in computer science and information technology. Planned economies contrast with command economies. A planned economy is "an economic system in which the government controls and regulates production, distribution, prices, etc." whereas a command economy necessarily has substantial public ownership of industry while also having this type of regulation. Most of a command economy is organized in a top-down administrative model by a central authority, where decisions regarding investment and production output requirements are decided upon at the top in the chain of command, with little input from lower levels. Advocates of economic planning have sometimes been staunch critics of these command economies. For example, Leon Trotsky believed that those at the top of the chain of command, regardless of their intellectual capacity, operated without the input and participation of the millions of people who participate in the economy and who understand/respond to local conditions and changes in the economy, and therefore would be unable to effectively coordinate all economic activity. Although historians have associated planned economies with Marxist–Leninist states and the Soviet economic model, some argue[weasel words] that the Soviet economic model did not actually constitute a planned economy in that a comprehensive and binding plan did not guide production and investment, therefore the further distinction of an administrative command economy emerged as a more accurate designation for the economic system that existed in the former Soviet Union and Eastern Bloc, highlighting the role of centralized hierarchical decision-making in the absence of popular control over the economy. The possibility of a digital planned economy was explored in Chile between 1971 and 1973 with the development of Project Cybersyn and by Alexander Kharkevich [ru], head of the Department of Technical Physics in Kiev in 1962. Another key point is that command economies are inherently authoritarian whereas economic planning in general can be either participatory and democratic or authoritarian. Indicative planning is a form of planning in market economies that directs the economy through incentive-based methods. Economic planning can be practiced in a decentralized manner through different government authorities. For example, in some predominately market-oriented and mixed economies[which?] the state utilizes economic planning in strategic industries, such as the aerospace industry. Mixed economies usually employ macroeconomic planning while micro-economic affairs are left to the market and price system. Note too the utilization of dirigisme, or government direction of the economy through non-coercive means, as practiced in France and in Great Britain after World War II. The Swedish government planned public-housing models in a similar fashion as urban planning in a project called Million Programme, implemented from 1965 to 1974. In the Hellenistic and post-Hellenistic world, "compulsory state planning was the most characteristic trade condition for the Egyptian countryside, for Hellenistic India, and to a lesser degree the more barbaric regions of the Seleucid, the Pergamenian, the southern Arabian, and the Parthian empires [...]". One view of mercantilism sees it as a planned economy. Scholars have argued that the Incan economy was a flexible type of command economy, centered around the movement and utilization of labor instead of goods. The Soviet-style planned economy started with war communism (1918–1921). The Soviet government founded Gosplan in 1921, but the period of the New Economic Policy intervened before regular five-year plans started in 1928. The government can harness land, labours and capital to serve the economic objectives of the state. Consumer demand can be restrained in favor of greater capital investment for economic development in a desired pattern. In international comparisons, state-socialist nations compared favorably with capitalist nations in health indicators such as infant mortality and life expectancy, although the statistics concerning infant mortality are self-reported and based on varying standards. The state can begin building a heavy industry at once in an underdeveloped economy without waiting years for capital to accumulate through the expansion of light industry and without reliance on external financing. This is what happened in the Soviet Union during the 1930s when the government forced the share of gross national income dedicated to private consumption from eighty percent to fifty percent. As a result, the Soviet Union experienced massive growth in heavy industry, with a concurrent massive contraction of its agricultural sector, in both relative and absolute terms. Critics of planned economies argue that planners cannot detect consumer preferences, shortages and surpluses with sufficient accuracy and therefore cannot efficiently co-ordinate production (in a market economy, a free price system is intended to serve this purpose). This difficulty was notably written about by economists Ludwig von Mises and Friedrich Hayek, who referred to subtly distinct aspects of the problem as the economic calculation problem and local knowledge problem, respectively. Whereas the former stressed the theoretical underpinnings of a market economy to subjective value theory while attacking the labor theory of value, the latter argued that the only way to satisfy individuals who have a constantly changing hierarchy of needs and are the only ones to possess their particular individual's circumstances is by allowing those with the most knowledge of their needs to have it in their power to use their resources in a competing marketplace to meet the needs of the most consumers most efficiently. This phenomenon is recognized as spontaneous order. Additionally, misallocation of resources would naturally ensue by redirecting capital away from individuals with direct knowledge and circumventing it into markets where a coercive monopoly influences behavior, ignoring market signals. According to Tibor R. Machan: "Without a market in which allocations can be made in obedience to the law of supply and demand, it is difficult or impossible to funnel resources with respect to actual human preferences and goals". Combined with a more democratic political system, and redone to closer approximate a best case version, centrally planned economies no doubt would have performed better. But they could never have delivered economic self-management, they would always have been slow to innovate as apathy and frustration took their inevitable toll, and they would always have been susceptible to growing inequities and inefficiencies as the effects of differential economic power grew. Under central planning neither planners, managers, nor workers had incentives to promote the social economic interest. Nor did impeding markets for final goods to the planning system enfranchise consumers in meaningful ways. But central planning would have been incompatible with economic democracy even if it had overcome its information and incentive liabilities. And the truth is that it survived as long as it did only because it was propped up by unprecedented totalitarian political power. Studies of administrative command economies of the Eastern Bloc in the 1950s and 1960s by both American and Eastern European economists found that contrary to the expectations of both groups they showed greater fluctuations in output than market economies during the same period. While socialism is not equivalent to economic planning or to the concept of a planned economy, an influential conception of socialism involves the replacement of capital markets with some form of economic planning in order to achieve ex-ante coordination of the economy. The goal of such an economic system would be to achieve conscious control over the economy by the population, specifically so that the use of the surplus product is controlled by the producers. The specific forms of planning proposed for socialism and their feasibility are subjects of the socialist calculation debate. In their book Towards a New Socialism (1993), the computer scientist Paul Cockshott from the University of Glasgow and the economist Allin Cottrell from the Wake Forest University claim to demonstrate how a democratically planned economy built on modern computer technology is possible and drives the thesis that it would be both economically more stable than the free market economies and also morally desirable. When the development of computer technology was still its early stages in 1971, the socialist Allende administration of Chile launched Project Cybersyn to install a telex machine in every corporation and organisation in the economy for the communication of economic data between firms and the government. The data was also fed into a computer simulated economy for forecasting. A control room was built for realtime observation and management of the overall economy. The prototype-stage of the project showed promise when it was used to redirect supplies around a trucker's strike, but after CIA-backed Augusto Pinochet led a coup in 1973 and then established a military dictatorship under his rule the program was abolished and Pinochet moved Chile towards a more liberalized market economy. The 1888 novel Looking Backward by Edward Bellamy depicts a fictional planned economy in a United States around the year 2000 which has become a socialist utopia. The World State in Aldous Huxley's Brave New World and Airstrip One in George Orwell's Nineteen Eighty-Four are both fictional examples of command economies, albeit with diametrically opposed aims. The former is a consumer economy designed to engender productivity while the latter is a shortage economy designed as an agent of totalitarian social control. Airstrip One is organised by the euphemistically named Ministry of Plenty. Other literary portrayals of planned economies were Yevgeny Zamyatin's We which was an influence on Orwell's work. Like Nineteen Eighty-Four, Ayn Rand's dystopian story Anthem was also an artistic portrayal of a command economy that was influenced by We. The difference is that it was a primitivist planned economy as opposed to the advanced technology of We or Brave New World. ^ Alec Nove (1987). "Planned Economy". The New Palgrave: A Dictionary of Economics. vol. 3. p. 879. ^ Devine, Pat (26 July 2010). Democracy and Economic Planning. Polity. ISBN 978-0745634791. ^ Zimbalist, Sherman and Brown, Andrew, Howard J. and Stuart (October 1988). Comparing Economic Systems: A Political-Economic Approach. Harcourt College Pub. p. 4. ISBN 978-0-15-512403-5. Almost all industry in the Soviet Union is government owned and all production is directed, in theory, by a central plan (though in practice much is left for local discretion and much happens that is unplanned or not under government control). ^ Wilhelm, John Howard (1985). "The Soviet Union Has an Administered, Not a Planned, Economy". Soviet Studies. 37 (1): 118–30. doi:10.1080/09668138508411571. ^ Ellman, Michael (2007). "The Rise and Fall of Socialist Planning". In Estrin, Saul; Kołodko, Grzegorz W.; Uvalić, Milica (eds.). Transition and Beyond: Essays in Honour of Mario Nuti. New York: Palgrave Macmillan. p. 22. ISBN 0-230-54697-8. In the USSR in the late 1980s the system was normally referred to as the 'administrative-command' economy. What was fundamental to this system was not the plan but the role of administrative hierarchies at all levels of decision making; the absence of control over decision making by the population [...]. ^ Rosser, Mariana V.; Rosser, J. Barkley (23 July 2003). Comparative Economics in a Transforming World Economy. MIT Press. p. 7. ISBN 978-0-262-18234-8. In a command economy the most important allocation decisions are made by government authorities and are imposed by law. ^ Prychito, David L. (31 July 2002). Markets, Planning, and Democracy: Essays After the Collapse of Communism. Edward Elgar Publishing. p. 72. ISBN 978-1840645194. Traditional socialism strives to plan all economic activities comprehensively, both within and between enterprises. As such, it seeks to integrate the economic activities of society (the coordination of socially owned property) into a single coherent plan, rather than to rely upon the spontaneous or anarchic ordering of the market system to coordinate plans. ^ Mandel, Ernest (1986). "In Defence of Socialist Planning" (PDF). New Left Review. 159: 5–37. Planning is not equivalent to 'perfect' allocation of resources, nor 'scientific' allocation, nor even 'more humane' allocation. It simply means 'direct' allocation, ex ante. As such, it is the opposite of market allocation, which is ex post. ^ Ellman, Michael (31 March 1989). Socialist Planning. Cambridge University Press. p. 327. ISBN 978-0521358668. '[S]ocialist planning', in the original sense of a national economy which replaced market relationships by direct calculation and direct product exchange, has nowhere been established [...]. ^ Cottrell, Allin; Cockshott, W. Paul (1993). Towards a New Socialism. Nottingham, England: Spokesman. Retrieved 28 February 2017. ^ "Planned economy". Dictionary.com. Unabridged (v. 1.1). Random House, Inc. Retrieved 11 May 2008). ^ "Command economy". Merriam-Webster Online Dictionary. Retrieved 11 May 2008. ^ Trotsky, Leon. Writings 1932–33. p. 96. ^ Ellman, Michael (2007). "The Rise and Fall of Socialist Planning". In Estrin, Saul; Kołodko, Grzegorz W.; Uvalić, Milica (eds.). Transition and Beyond: Essays in Honour of Mario Nuti. New York: Palgrave Macmillan. p. 22. ISBN 0-230-54697-8. Realization of these facts led in the 1970s and 1980s to the development of new terms to describe what had previously been (and still were in United Nations publications) referred to as the 'centrally planned economies'. In the USSR in the late 1980s the system was normally referred to as the 'administrative-command' economy. What was fundamental to this system was not the plan but the role of administrative hierarchies at all levels of decision making; the absence of control over decision making by the population [...]. ^ "Machine of communism. Why the USSR did not create the Internet". ^ Kharkevich, Aleksandr Aleksandrovich (1973). Theory of information. The identification of the images. Selected works in three volumes. Volume 3. Information and technology: Moscow: Publishing House "Nauka", 1973. - Academy of Sciences of the USSR. Institute of information transmission problems. p. 524. ^ Heichelheim, Friedrich Moritz (1970) . "Commerce, Greek and Roman". In Hammond, Nicholas G. L.; Scullard, H. H. (eds.). The Oxford Classical Dictionary (2 ed.). Oxford: Oxford University Press. p. 274. ISBN 0198691173. ^ Blaug, Mark, ed. (1991). The Early mercantilists: Thomas Mun (1571-1641), Edward Misselden (1608-1634), Gerard de Malynes (1586-1623). Pioneers in economics. E. Elgar Pub. Co. p. 136. Retrieved 7 September 2018. To this approach belongs at least in part an attempt to view mercantilism as economic dirigee, a planned economy with national economic objectives — 'wealth', 'plenty' or simply 'welfare' within the framework of the nation and at the expense of other nations. ^ La Lone, Darrell E. "The Inca as a Nonmarket Economy: Supply on Command versus Supply and Demand". p. 292. Retrieved 17 December 2018. ^ Michael Ellman (2014). Socialist Planning. Cambridge University Press. p. 372. ISBN 1107427320. ^ Kennedy, Paul (1987). The Rise and Fall of the Great Powers. New York: Random House. pp. 322–3. ISBN 0-394-54674-1. ^ Von Mises, Ludwig (1990). Economic calculation in the Socialist Commonwealth (PDF). Ludwig von Mises Institute. Retrieved 8 September 2008. ^ Hayek, Friedrich A. (1945). "The Use of Knowledge". American Economic Review. XXXV: 4. pp. 519-30. ^ Machan, R. Tibor (2002). "Some Skeptical Reflections on Research and Development". Liberty and Research and Development: Science Funding in a Free Society (PDF). Hoover Press. ISBN 0-8179-2942-8. ^ a b Hahnel, Robin (2002). The ABC's of Political Economy. London: Pluto Press. p. 262. ISBN 0-7453-1858-4. ^ Zielinski, J. G. (1973). Economic Reforms in Polish Industry. New York: Oxford University Press. ISBN 0-19-215323-4. ^ Feinstein, C. H. (1975). Socialism, Capitalism and Economic Growth: Essays Presented to Maurice Dobb. Cambridge University Press. p. 174. ISBN 0-521-29007-4. We have presented the view that planning and market mechanisms are instruments that can be used both in socialist and non-socialist societies. [...] It was important to explode the primitive identification of central planning and socialism and to stress the instrumental character of planning. ^ Eden Medina (2006). "Designing Freedom, Regulating a Nation: Socialist Cybernetics in Allende's Chile". J. Lat. Am. Stud. Cambridge University Press (38): 571–606. doi:10.1017/S0022216X06001179. ^ Crittenden, Ann. "The Cuban Economy: How It Works". Retrieved 29 June 2018. Ellman, Michael (2014). Socialist Planning. Cambridge University Press. 3rd edition. ISBN 1107427320. Grossman, Gregory (1987): "Command economy". The New Palgrave: A Dictionary of Economics. vol. 1. pp. 494–95. Landauer, Carl (1947). Theory of National Economic Planning. University of California Press. Berkeley and Los Angeles. 2nd edition. Nove, Alec (1987). "Planned economy". The New Palgrave: A Dictionary of Economics. vol. 3. pp. 879–85. Myant, Martin; Drahokoupil, Jan (2010), Transition Economies: Political Economy in Russia, Eastern Europe, and Central Asia, Wiley-Blackwell, ISBN 978-0-470-59619-7 . Cox, Robin (2005). "The Economic Calculation controversy: unravelling of a myth". Devine, Pat (2010). Democracy and Economic Planning. Polity. ISBN 978-0745634791. Mandel, Ernest (1986). In Defence of Socialist Planning. New Left Review. 159. "An article against "The myth of the permanent arms economy"
"The Stalin Model for the Control and Coordination of Enterprises in a Socialist Economy"
An economic system is a system of production, resource allocation and distribution of goods and services within a society or a given geographic area. It includes the combination of the various institutions, agencies, entities, decision-making processes and patterns of consumption that comprise the economic structure of a given community. As such, an economic system is a type of social system. The mode of production is a related concept. All economic systems have three basic questions to ask: what to produce, how to produce and in what quantities and who receives the output of production. Oskar Ryszard Lange was a Polish economist and diplomat. 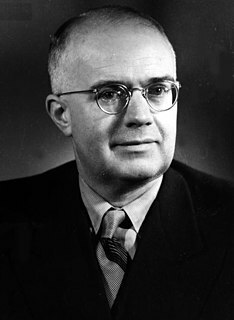 He is best known for advocating the use of market pricing tools in socialist systems and providing a model of market socialism. He responded to the economic calculation problem proposed by Ludwig von Mises and Friedrich Hayek by claiming that managers in a centrally-planned economy would be able to monitor supply and demand through increases and declines in inventories of goods, and advocated the nationalization of major industries. During his stay in the United States, Lange was a sought-after academic teacher and researcher in mathematical economics. Later in communist Poland, he was a member of the Central Committee of the Polish United Workers' Party and a believer in centrally-managed economy. Robin Eric Hahnel is an American economist and professor of economics at Portland State University. He was a professor at American University for many years and traveled extensively advising on economic matters all over the world. He is best known for his work on participatory economics with Z Magazine editor Michael Albert. A decentralized-planned economy or decentrally-planned economy is a type of planned economy in which the investment and allocation of consumer and capital goods is explicate accordingly to an economy-wide plan built and operatively coordinated through a distributed network of disparate economic agents or even production units itself. Decentralized planning is usually held in contrast to centralized planning, in particular the Soviet Union's command economy, where economic information is aggregated and used to formulate a plan for production, investment and resource allocation by a single central authority. Decentralised planning can take shape both in the context of a mixed economy as well as in a post-capitalist economic system. Project Cybersyn was a Chilean project from 1971–1973 during the presidency of Salvador Allende aimed at constructing a distributed decision support system to aid in the management of the national economy. The project consisted of four modules: an economic simulator, custom software to check factory performance, an operations room, and a national network of telex machines that were linked to one mainframe computer.